Most people are aware that smoking, drinking alcohol and eating junk food can have a negative effect on their health. However, the thought of listening to their iPods usually does not come to mind when thinking of unhealthy habits. They are almost everywhere you go. People with headphones on, zoned out in another world, bobbing their heads to their favorite tunes. What they might not know is they could be putting themselves at risk. Between 2004 and 2011, fatal injuries to pedestrians who were listening to headphones more than tripled, according to researchers from the University of Maryland. The National Electronic Injury Surveillance system conducted a study in 2011 on injuries to pedestrians and found that there were 116 accidents involving pedestrians listening to headphones being hit by cars or trains. In this study, 70 percent of these accidents ended in death. These types of accidents, called distraction-by-device, have been studied for years. CNET defined as “inattention blindness,” when the brain’s resources are divided by multiple stimuli. The two most common electronic devices which cause distractions are headphones and cell phones. CNET concluded that if pedestrians limit their use of headphones and cell phones while walking near cars and trains, fatal accidents will be less likely to occur. Hearing loss is another side of effect. People who regularly listen to music 88 decimals or higher with head phones are at high risk of permanent hearing loss as they get older, warned Infantino. Young adults usually do not experience hearing loss, however it can appear later in life. Temporary loss of hearing has been seen in teenagers as an effect of headphones, Infantino said. “I used to be able to hear whispers and now I can’t hear them anymore. I think that is because I put headphones on every day to listen to loud music,” Alex Zhang, a sophomore International Business major at LIU Post, said. The types of headphone that are inserted directly inside the ear can be even more dangerous. “Loud noises that go directly into your ear drum can certainly damage your hearing,” said Conni Montalbano, a nurse at LIU Post. 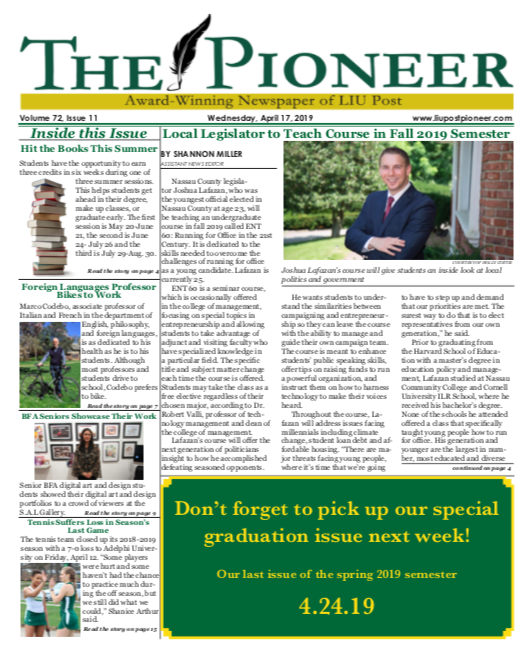 Before joining LIU Post, Infantino was a nurse at Federal Express at JFK Airport, which has a hearing conservation program for the employees who work near the airplane engines. They used headsets while working and their hearing was inspected every year. Infantino said several workers stopped using headphones after they kept getting ear infections and over time, “suffered the worse permanent hearing loss.” The workers felt that since it was their job, they had no other choice. Infantino explained that the headphones caused hearing loss that the workers were not aware of until it was too late. “And now we have a whole population of iPod users that are putting themselves at risk for the same things we tried so hard to prevent at Federal Express,” she said.